This article is about the state that existed from 1707 to 1800. For the modern state, see United Kingdom. The Kingdom of Great Britain, officially called simply Great Britain, was a sovereign state in western Europe from 1 May 1707 to 31 December 1800. 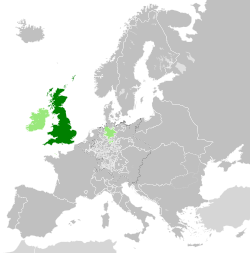 The state came into being following the Treaty of Union in 1706, ratified by the Acts of Union 1707, which united the kingdoms of England (which included Wales) and Scotland to form a single kingdom encompassing the whole island of Great Britain and its outlying islands, with the exception of the Isle of Man and the Channel Islands. The unitary state was governed by a single parliament and government that was based in Westminster. The former kingdoms had been in personal union since James VI of Scotland became King of England and King of Ireland in 1603 following the death of Elizabeth I, bringing about the "Union of the Crowns". After the accession of George I to the throne of Great Britain in 1714, the kingdom was in a personal union with the Electorate of Hanover. ^ Monarch of England and Scotland from 1702 to 1707. ^ Continued as monarch of the United Kingdom until 1820. The early years of the unified kingdom were marked by Jacobite risings which ended in defeat for the Stuart cause at Culloden in 1746. In 1763, victory in the Seven Years' War led to the dominance of the British Empire, which was to become the foremost global power for over a century and slowly grew to become the largest empire in history. The Kingdom of Great Britain was replaced by the United Kingdom of Great Britain and Ireland on 1 January 1801 with the Acts of Union 1800. The name Britain descends from the Latin name for the island of Great Britain, Britannia or Brittānia, the land of the Britons via the Old French Bretaigne (whence also Modern French Bretagne) and Middle English Bretayne, Breteyne. The term Great Britain was first used officially in 1474. The use of the word "Great" before "Britain" originates in the French language, which uses Bretagne for both Britain and Brittany. French therefore distinguishes between the two by calling Britain la Grande Bretagne, a distinction which was transferred into English. The Treaty of Union and the subsequent Acts of Union state that England and Scotland were to be "United into One Kingdom by the Name of Great Britain", and as such "Great Britain" was the official name of the state, as well as being used in titles such as "Parliament of Great Britain". Both the Acts and the Treaty describe the country as "One Kingdom" and a "United Kingdom", which has led some much later publications into the error of treating the "United Kingdom" as a name before it actually came into being in 1801. The websites of the Scottish Parliament, the BBC, and others, including the Historical Association, refer to the state created on 1 May 1707 as the United Kingdom of Great Britain. The term United Kingdom was sometimes used during the 18th century to describe the state, but was not its name. The kingdoms of England and Scotland, both in existence from the 9th century (with England incorporating Wales in the 16th century), were separate states until 1707. However, they had come into a personal union in 1603, when James VI of Scotland became king of England under the name of James I. This Union of the Crowns under the House of Stuart meant that the whole of the island of Great Britain was now ruled by a single monarch, who by virtue of holding the English crown also ruled over the Kingdom of Ireland. Each of the three kingdoms maintained its own parliament and laws. Various smaller islands were in the king's domain, including the Isle of Man and the Channel Islands. This disposition changed dramatically when the Acts of Union 1707 came into force, with a single unified Crown of Great Britain and a single unified parliament. Ireland remained formally separate, with its own parliament, until the Acts of Union 1800. The Union of 1707 provided for a Protestant-only succession to the throne in accordance with the English Act of Settlement of 1701; rather than Scotland's Act of Security of 1704, which ceased to have effect. The Act of Settlement required that the heir to the English throne be a descendant of the Electress Sophia of Hanover and not be a Catholic; this brought about the Hanoverian succession of George I in 1714. Legislative power was vested in the Parliament of Great Britain, which replaced both the Parliament of England and the Parliament of Scotland. In practice it was a continuation of the English parliament, sitting at the same location in Westminster, expanded to include representation from Scotland. As with the former Parliament of England and the modern Parliament of the United Kingdom, the Parliament of Great Britain was formally constituted of three elements: the House of Commons, the House of Lords, and the Crown. The right of the English peerage to sit in the House of Lords remained unchanged, while the disproportionately large Scottish peerage was permitted to send only 16 representative peers, elected from amongst their number for the life of each parliament. Similarly, the members of the former English House of Commons continued as members of the British House of Commons, but as a reflection of the relative tax bases of the two countries the number of Scottish representatives was reduced to 45. Newly created peers in the Peerage of Great Britain were given the automatic right to sit in the Lords. Despite the end of a separate parliament for Scotland, it retained its own laws and system of courts, As its own established Presbyterian Church, and control over its own schools. The social structure was highly hierarchical, and the same elite remain in control after 1707. Scotland continued to have its own excellent universities, and with the strong intellectual community, especially in Edinburgh, The Scottish Enlightenment had a major impact on British, American and European thinking. As a result of Poynings' Law of 1495, the Parliament of Ireland was subordinate to the Parliament of England, and after 1707 to the Parliament of Great Britain. The Westminster parliament's Declaratory Act 1719 (also called the Dependency of Ireland on Great Britain Act 1719) noted that the Irish House of Lords had recently "assumed to themselves a Power and Jurisdiction to examine, correct and amend" judgements of the Irish courts and declared that as the Kingdom of Ireland was subordinate to and dependent upon the crown of Great Britain, the King, through the Parliament of Great Britain, had "full power and authority to make laws and statutes of sufficient validity to bind the Kingdom and people of Ireland". The Act was repealed by the Repeal of Act for Securing Dependence of Ireland Act 1782. The same year, the Irish constitution of 1782 produced a period of legislative freedom. However, the Irish Rebellion of 1798, which sought to end the subordination and dependency upon the British crown and establish a republic, was one of the factors that led to the formation of the United Kingdom of Great Britain and Ireland in 1801. The deeper political integration of her kingdoms was a key policy of Queen Anne, the last Stuart monarch of England and Scotland and the first monarch of Great Britain. A Treaty of Union was agreed in 1706 following negotiations between representatives of the parliaments of England and Scotland, and each parliament then passed separate Acts of Union to ratify it. The Acts came into effect on 1 May 1707, uniting the separate Parliaments and crowns of England and Scotland and forming a single Kingdom of Great Britain. Anne became the first monarch to occupy the unified British throne, and in line with Article 22 of the Treaty of Union, Scotland and England each sent members to the new House of Commons of Great Britain. Scottish and English elites retained power, and each kept its legal and educational systems, as well as its established Church. United they formed a larger economy, and the Scots began to provide soldiers and colonial officials to the new British forces and its Empire. However, in practice the new Scottish members and representative peers were elected by the outgoing Parliament of Scotland, while all existing members of the Houses of Commons and Lords at Westminster remained in office. In the 18th century England, and after 1707 Great Britain, rose to become the world's dominant colonial power, with France as its main rival on the imperial stage. The pre-1707 English overseas possessions became the nucleus of the First British Empire. "In 1714 the ruling class was so bitterly divided that many feared a civil war might break out on Queen Anne's death", says historian W. A. Speck. A couple of hundred of the richest landed elite families controlled politics, but they were deeply split, with Tories committed to the legitimacy of the Stuart "Old Pretender", then in exile. The Whigs strongly supported the king in order to uphold the Protestant succession. The new King George I was an unpopular German, and had only a small English army to support him. He did have military support from his native Hanover, and from his allies in the Netherlands. The Earl of Mar led 18 peers with 10,000 men in the Jacobite rising of 1715 based in Scotland which aimed to overthrow the king. It was poorly organised, and was decisively defeated, with several leaders executed, many leaders dispossessed of their lands, and 700 prominent followers deported to labour in the West Indies sugar plantations. A key decision was the refusal of the Pretender to change his religion from Catholic to Anglican, which probably would have mobilised much more of the Tory element. The Whigs came to power under the leadership of James Stanhope, Charles Townshend, the Earl of Sunderland, and Robert Walpole. One by one the Tories were driven out of national and local government, and new laws were passed to impose more national control. The right of habeas corpus was restricted; to reduce electoral frenzy, the Septennial Act 1715 increased the maximum life of a parliament from three years to seven. He spent only about half as much time abroad during his reign as did William III, who also reigned for 13 years. Jeremy Black has argued that the king wanted to spend even more time in Hanover: "His visits, in 1716, 1719, 1720, 1723 and 1725, were lengthy, and, in total, he spent a considerable part of his reign abroad. These visits were also occasions both for significant negotiations and for the exchange of information and opinion....The visits to Hanover also provided critics with the opportunity...to argue that British interests were being neglected....George could not speak English, and all relevant documents from his British ministers were translated into French for him....Few British ministers or diplomats...knew German, or could handle it in precise discussion." Corporate stock was a new phenomenon, not well understood except for the strong gossip among financiers that fortunes could be made overnight. The South Sea Company, although originally set up to trade with the Spanish Empire, quickly turned most of its attention to very high risk financing, involving £30 million or 60% of the entire British national debt. It set up a scheme that invited stock owners to turn in their certificates for stock in the Company at a par value of £100—the idea was they would profit by the rising price of the stock. Everyone with connections wanted in on the bonanza—and many other outlandish schemes found gullible takers. South Sea stock peaked at £1060 on 25 June 1720. Then the bubble burst, and by the end of September it had fallen to £150. Hundreds of prominent men had borrowed to buy stock high; their "profits" had vanished but they were liable to repay the full amount of the loans. Many went bankrupt and many more lost heavily. Confidence in the entire national financial and political system had collapsed. Parliament investigated and concluded that there was widespread fraud amongst the company directors and corruption in the Cabinet. Among Cabinet members implicated were the Chancellor of the Exchequer, the Postmaster General, and a Secretary of State, as well as the two top leaders Lord Stanhope and Lord Sunderland. Walpole had dabbled in the speculation himself but was not a major player. He rose to the challenge, as the new First Lord of the Treasury, of resolving the financial and political disaster. The economy was basically healthy, and the panic ended. Working with the financiers he successfully restored confidence in the system. However, public opinion, as shaped by the many prominent men who had lost so much money so quickly, demanded revenge. Walpole supervised the process, which removed all 33 company directors and stripped them of, on average, 82% of their wealth. The money went to the victims. The government bought the stock of the South Sea Company for £33 and sold it to the Bank of England and the East India Company, the only other two corporations big enough to handle the challenge. Walpole made sure that King George and his mistresses were not embarrassed, and by the margin of three votes he saved several key government officials from impeachment. Stanhope and Sunderland died of natural causes, leaving Walpole alone as the dominant figure in British politics. The public hailed him as the saviour of the financial system, and historians credit him with rescuing the Whig government, and indeed the Hanoverian dynasty, from total disgrace. Walpole was a master of the effective use of patronage, as were Pelham and Lord Newcastle. They each paid close attention to the work of bestowing upon their political allies high places, lifetime pensions, honours, lucrative government contracts, and help at election time. In turn the friends enabled them to control Parliament. Thus in 1742, over 140 Members of Parliament held powerful positions thanks in part to Walpole, including 24 men at the royal court, 50 in the government agencies, and the rest with sinecures or other handsome emoluments, often in the range of £500 - £1000 per year. Usually there was little or no work involved. Walpole also distributed highly attractive ecclesiastical appointments. When the Court in 1725 instituted a new order of chivalry, the Order of the Bath, Walpole immediately seized the opportunity. He made sure that most of the 36 new honorees were peers and MPs who would provide him with useful connections. 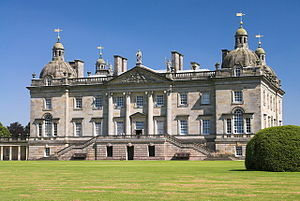 Walpole himself became enormously wealthy, investing heavily in his estate at Houghton Hall and its large collection of European master paintings. The opposition called for "patriotism" and looked at the Prince of Wales as the future "Patriot King". Walpole supporters ridiculed the very term "patriot". The opposition "country party" attacked Walpole relentlessly, primarily targeting patronage, which they denounced as immoral corruption. In turn Walpole imposed censorship on the London theatre and subsidised writers such as William Arnall and others who rejected the charge of evil political corruption by arguing that corruption is the universal human condition. Furthermore, they argued, political divisiveness was also universal and inevitable because of selfish passions that were integral to human nature. Arnall argued that government must be strong enough to control conflict, and in that regard Walpole was quite successful. This style of "court" political rhetoric continued through the 18th century. Field Marshal Lord Cobham, a leading soldier, used his own connections to build up an opposition after 1733. Young William Pitt and George Grenville joined Cobham's faction—they were called "Cobham's Cubs". They became leading enemies of Walpole and both later became prime minister. Walpole's allies defeated a censure motion by a vote of 209 to 106, but Walpole's coalition lost seats in the election of 1741 and by a narrow margin he was finally forced out of power in early 1742. Walpole secured widespread support with his policy of avoiding war. He used his influence to prevent George II from entering the War of the Polish Succession in 1733, because it was a dispute between the Bourbons and the Habsburgs. He boasted, "There are 50,000 men slain in Europe this year, and not one Englishman." Walpole himself let others, especially his brother-in-law Lord Townshend, handle foreign policy until about 1726, then took charge. A major challenge for his administration was the royal role as simultaneous ruler of Hanover, a small German state that was opposed to Prussian supremacy. George I and George II saw a French alliance as the best way to neutralise Prussia. They forced a dramatic reversal of British foreign policy, which for centuries had seen France as England's greatest enemy. However, the bellicose trouble-maker King Louis XIV died in 1715, and the regents who ran France were preoccupied with internal affairs. 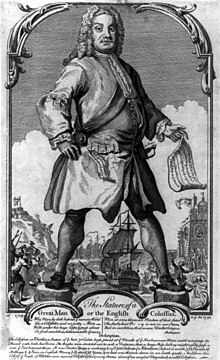 King Louis XV came of age in 1726, and his elderly chief minister Cardinal Fleury collaborated informally with Walpole to prevent a major war and keep the peace. Both sides wanted peace, which allowed both countries enormous cost savings, and recovery from expensive wars. Henry Pelham became prime minister in 1744 and continued Walpole's policies. He worked for an end to the War of the Austrian Succession. His financial policy was a major success once peace had been signed in 1748. He demobilised the armed forces, and reduced government spending from £12 million to £7 million. He refinanced the national debt, dropping the interest rate from 4% p.a. to 3% p.a. Taxes had risen to pay for the war, but in 1752 he reduced the land tax from four shillings to two shillings in the pound: that is, from 20% to 10%. By avoiding wars, Walpole could lower taxes. He reduced the national debt with a sinking fund, and by negotiating lower interest rates. He reduced the land tax from four shillings in 1721, to 3s in 1728, 2s in 1731 and finally to only 1s (i.e. 5%) in 1732. His long-term goal was to replace the land tax, which was paid by the local gentry, with excise and customs taxes, which were paid by merchants and ultimately by consumers. Walpole joked that the landed gentry resembled hogs, which squealed loudly whenever anyone laid hands on them. By contrast, he said, merchants were like sheep, and yielded their wool without complaint. The joke backfired in 1733 when he was defeated in a major battle to impose excise taxes on wine and tobacco. To reduce the threat of smuggling, the tax was to be collected not at ports but at warehouses. This new proposal, however, was extremely unpopular with the public, and aroused the opposition of the merchants because of the supervision it would involve. Walpole was defeated as his strength in Parliament dropped a notch. Walpole was one of the greatest politicians in British history. He played a significant role in sustaining the Whig party, safeguarding the Hanoverian succession, and defending the principles of the Glorious Revolution (1688) ... He established a stable political supremacy for the Whig party and taught succeeding ministers how best to establish an effective working relationship between Crown and Parliament. The Seven Years' War, which began in 1756, was the first war waged on a global scale and saw British involvement in Europe, India, North America, the Caribbean, the Philippines, and coastal Africa. The results were highly favorable for Britain, and a major disaster for France. Key decisions were largely in the hands of William Pitt the Elder. The war started poorly. Britain lost the island of Minorca in 1756, and suffered a series of defeats in North America. After years of setbacks and mediocre results, British luck turned in the "miracle year" ("Annus Mirabilis") of 1759. The British had entered the year anxious about a French invasion, but by the end of the year, they were victorious in all theatres. In the Americas, they captured Fort Ticonderoga (Carillon), drove the French out of the Ohio Country, captured Quebec City in Canada as a result of the decisive Battle of the Plains of Abraham, and captured the rich sugar island of Guadeloupe in the West Indies. In India, the John Company repulsed French forces besieging Madras. In Europe, British troops partook in a decisive Allied victory at the Battle of Minden. The victory over the French navy at the Battle of Lagos and the decisive Battle of Quiberon Bay ended threats of a French invasion, and confirmed Britain's reputation as the world's foremost naval power. The Treaty of Paris of 1763 marked the high point of the First British Empire. France's future in North America ended, as New France (Quebec) came under British control. In India, the third Carnatic War had left France still in control of several small enclaves, but with military restrictions and an obligation to support the British client states, effectively leaving the future of India to Great Britain. The British victory over France in the Seven Years' War therefore left Great Britain as the world's dominant colonial power, with a bitter France thirsting for revenge. The evangelical movement inside and outside the Church of England gained strength in the late 18th and early 19th century. The movement challenged the traditional religious sensibility that emphasized a code of honor for the upper-class, and suitable behaviour for everyone else, together with faithful observances of rituals. John Wesley (1703–1791) and his followers preached revivalist religion, trying to convert individuals to a personal relationship with Christ through Bible reading, regular prayer, and especially the revival experience. Wesley himself preached 52,000 times, calling on men and women to "redeem the time" and save their souls. Wesley always operated inside the Church of England, but at his death, it set up outside institutions that became the Methodist Church. It stood alongside the traditional nonconformist churches, Presbyterians, Congregationalist, Baptists, Unitarians and Quakers. The nonconformist churches, however, were less influenced by revivalism. The first British Empire, was based largely in North America in the West Indies, with a growing presence in India. Emigration from Britain went mostly to the 13 American colonies, and to a lesser extent to Newfoundland and Nova Scotia. Very few permanent settlers went to India. Mercantilism was the basic policy imposed by Great Britain on its overseas possessions. Mercantilism meant that the government and the merchants became partners with the goal of increasing political power and private wealth, to the exclusion of other empires. The government protected its merchants—and kept others out—by trade barriers, regulations, and subsidies to domestic industries to maximise exports from and minimise imports to the realm. The government had to fight smuggling—which became a favourite American technique in the 18th century to circumvent the restrictions on trading with the French, Spanish or Dutch. The goal of mercantilism was to run trade surpluses, so that gold and silver would pour into London. The government took its share through duties and taxes, with the remainder going to merchants in London and other British ports. The government spent much of its revenue on a superb Royal Navy, which not only protected the British colonies but threatened the colonies of the other empires, and sometimes seized them. Thus the Royal Navy captured New Amsterdam (later New York) in 1664. The colonies were captive markets for British industry, and the goal was to enrich the mother country. During the 1760s and 1770s, relations with the Thirteen Colonies turned from benign neglect to outright revolt, primarily because of the British Parliament's insistence on taxing colonists without their consent. In 1775, the American Revolutionary War began, as the Americans trapped the British army in Boston and suppressed the Loyalists who supported the Crown. In 1776 the Americans declared the independence of the United States of America. Under the military leadership of General George Washington, and, with economic and military assistance from France, the Dutch Republic, and Spain, the United States held off successive British invasions. The Americans captured two main British armies in 1777 and 1781. After that King George III lost control of Parliament and was unable to continue the war. It ended with the Treaty of Paris by which Great Britain relinquished the Thirteen Colonies and recognized the United States. The war was expensive but the British financed it successfully. The loss of the Thirteen Colonies marked the transition between the "first" and "second" empires, in which Britain shifted its attention away from the Americas to Asia, the Pacific and later Africa. Adam Smith's Wealth of Nations, published in 1776, had argued that colonies were redundant, and that free trade should replace the old mercantilist policies that had characterised the first period of colonial expansion, dating back to the protectionism of Spain and Portugal. The growth of trade between the newly independent United States and Great Britain after 1781 confirmed Smith's view that political control was not necessary for economic success. After a series of "French and Indian wars", the British took over most of France's North American operations in 1763. New France became Quebec. Great Britain's policy was to respect Quebec's Catholic establishment as well as its semi-feudal legal, economic, and social systems. By the Quebec Act of 1774, the Province of Quebec was enlarged to include the western holdings of the American colonies. In the American Revolutionary War, Halifax, Nova Scotia became Britain's major base for naval action. They repulsed an American revolutionary invasion in 1776, but in 1777 a British invasion army was captured in New York, encouraging France to enter the war. After the American victory, between 40,000 and 60,000 defeated Loyalists migrated, some bringing their slaves. Most families were given free land to compensate their losses. Several thousand free blacks also arrived; most of them later went to Sierra Leone in Africa. The 14,000 Loyalists who went to the Saint John and Saint Croix river valleys, then part of Nova Scotia, were not welcomed by the locals. Therefore, in 1784 the British split off New Brunswick as a separate colony. The Constitutional Act of 1791 created the provinces of Upper Canada (mainly English-speaking) and Lower Canada (mainly French-speaking) to defuse tensions between the French and English-speaking communities, and implemented governmental systems similar to those employed in Great Britain, with the intention of asserting imperial authority and not allowing the sort of popular control of government that was perceived to have led to the American Revolution. In 1770, British explorer James Cook had discovered the eastern coast of Australia whilst on a scientific voyage to the South Pacific. In 1778, Joseph Banks, Cook's botanist on the voyage, presented evidence to the government on the suitability of Botany Bay for the establishment of a penal settlement. Australia marks the beginning of the Second British Empire. It was planned by the government in London and designed as a replacement for the lost American colonies. The American Loyalist James Matra in 1783 wrote "A Proposal for Establishing a Settlement in New South Wales" proposing the establishment of a colony composed of American Loyalists, Chinese and South Sea Islanders (but not convicts). Matra reasoned that the land was suitable for plantations of sugar, cotton and tobacco; New Zealand timber and hemp or flax could prove valuable commodities; it could form a base for Pacific trade; and it could be a suitable compensation for displaced American Loyalists. At the suggestion of Secretary of State Lord Sydney, Matra amended his proposal to include convicts as settlers, considering that this would benefit both "Economy to the Publick, & Humanity to the Individual". The government adopted the basics of Matra's plan in 1784, and funded the settlement of convicts. In 1787 the First Fleet set sail, carrying the first shipment of convicts to the colony. It arrived in January 1788. India was not directly ruled by the British government, instead certain parts were seized by the East India Company, a private, for-profit corporation, with its own army. The "John Company" (as it was nicknamed) took direct control of half of India and built friendly relations with the other half, which was controlled by numerous local princes. Its goal was trade, and vast profits for the Company officials, not the building of the British empire. Company interests expanded during the 18th century to include control of territory as the old Mughal Empire declined in power and the East India Company battled for the spoils with the French East India Company (Compagnie française des Indes orientales) during the Carnatic Wars of the 1740s and 1750s. 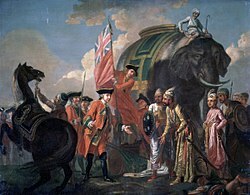 Victories at the Battle of Plassey and Battle of Buxar by Robert Clive gave the Company control over Bengal and made it the major military and political power in India. In the following decades it gradually increased the extent of territories under its control, ruling either directly or in cooperation with local princes. Although Britain itself only had a small standing army, the Company had a large and well trained force, the presidency armies, with British officers commanding native Indian troops (called sepoys). With the regicide of King Louis XVI in 1793, the French Revolution represented a contest of ideologies between conservative, royalist Britain and radical Republican France. The long bitter wars with France 1793-1815, saw anti-Catholicism emerge as the glue that held the three kingdoms together. From the upper classes to the lower classes, Protestants were brought together from England, Scotland and Ireland into a profound distrust and distaste for all things French. That enemy nation was depicted as the natural home of misery and oppression because of its inherent inability to shed the darkness of Catholic superstition and clerical manipulation. It was not only Britain's position on the world stage that was threatened: Napoleon, who came to power in 1799, threatened invasion of Great Britain itself, and with it, a fate similar to the countries of continental Europe that his armies had overrun. The Napoleonic Wars were therefore ones in which the British invested all the moneys and energies it could raise. French ports were blockaded by the Royal Navy. The French Revolution revived religious and political grievances in Ireland. In 1798, Irish nationalists, under Protestant leadership, plotted the Irish Rebellion of 1798, believing that the French would help them to overthrow the British.. They hoped for significant French support, which never came. The uprising was very poorly organized, and quickly suppressed by much more powerful British forces. Including many bloody reprisals, The total death toll was in the range of 10,000 to 30,000. William Pitt the Younger, the British prime minister, firmly believed that the only solution to the problem was a union of Great Britain and Ireland. The union was established by the Act of Union 1800; compensation and patronage ensured the support of the Irish Parliament. Great Britain and Ireland were formally united on 1 January 1801. The Irish Parliament was closed down. The Parliament of Great Britain consisted of the House of Lords (an unelected upper house of the Lords Spiritual and Temporal) and the House of Commons, the lower chamber, which was elected periodically. In England and Wales parliamentary constituencies remained unchanged throughout the existence of the Parliament. 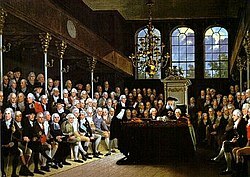 During the 18th century, the British Constitution developed significantly. As a result of the Union of 1707, no new peerages were created in the Peerage of England or the Peerage of Scotland. English peerages continued to carry the right to a seat in the House of Lords, while the Scottish peers elected representative peers from among their own number to sit in the Lords. Peerages continued to be created by the Crown, either in the new Peerage of Great Britain, which was that of the new kingdom and meant a seat in its House of Lords, or in the Peerage of Ireland, giving the holder a seat in the Irish House of Lords. For a more comprehensive list, see historiography of the United Kingdom and historiography of the British Empire. ^ Parliament of the Kingdom of England. Union with Scotland Act 1706, Article I, from legislation.gov.uk. "That the two Kingdoms of England and Scotland shall upon the First day of May which shall be in the year One thousand seven hundred and seven and for ever after be united into one Kingdom by the name of Great Britain ..."
^ The Acts of Union passed by both parliaments in 1800 and which created the United Kingdom, came into effect on 1 January 1801. ^ Denys Hay (1968). Europe: the emergence of an idea. Edinburgh U.P. p. 138. ^ "The Treaty (act) of the Union of Parliament 1706". Scots History Online. Retrieved 18 July 2011. "Union with England Act 1707". The national Archives. Retrieved 18 July 2011. ^ Harold Melvin Stanford, The Standard Reference Work: For the Home, School and Library, Volume 3 (1921): "From 1707 until 1801 Great Britain was the official designation of the kingdoms of England and Scotland"
^ United States Congressional serial set, Issue 10; Issue 3265 (1895): "In 1707, on the union with Scotland, 'Great Britain' became the official name of the British Kingdom, and so continued until the union with Ireland in 1801". ^ Scottish referendum: 50 fascinating facts you should know about Scotland www.telegraph.co.uk, 11 January 2012: "Scotland has been part of the United Kingdom for more than three hundred years"
^ "BBC - History - British History in depth: Acts of Union: The creation of the United Kingdom". ^ Bamber Gascoigne. "History of Great Britain (from 1707)". History World. Retrieved 18 July 2011. ^ Act of Union 1707, Article 3. ^ a b Williams, The Whig Supremacy: 1714 – 1760 (1962) pp 271–87. ^ Alexander Broadie, ed.. The Cambridge Companion to the Scottish Enlightenment (2003). ^ Arthur Herman, How the Scots Invented the Modern World: The True Story of How Western Europe's Poorest Nation Created Our World & Everything in It (2001). ^ Williams, The Whig Supremacy: 1714 – 1760 (1962) pp 287–306. ^ James Falkner (2015). The War of the Spanish Succession 1701–1714. Pen and Sword. pp. 22–25. ISBN 9781781590317. ^ David Loades, editor, Readers Guide to British History (2003) 2:1219-21. ^ Anthony, Pagden (2003). Peoples and Empires: A Short History of European Migration, Exploration, and Conquest, from Greece to the Present. Modern Library. p. 90. ^ W. A. Speck (1977). Stability and Strife: England, 1714–1760. Harvard UP. pp. 146–49. ISBN 9780674833500. ^ Dorothy Marshall, Eighteenth Century England (1974), pp 72–89. ^ Basil Williams, The Whig Supremacy: 1714–1716 (2nd ed. 1962), pp 150–65. ^ Julian Hoppit, A Land of Liberty? England 1689–1727 (2000), pp 392–98. ^ Speck, Stability and Strife: England, 1714–1760 (1977), pp 170–87. ^ Gibbs, G. C. (21 May 2009). "George I". Oxford Dictionary of National Biography. 1. doi:10.1093/ref:odnb/10538. ^ Jeremy Black (2016). Politics and Foreign Policy in the Age of George I, 1714–1727. pp. 44–45. ISBN 9781317078548. ^ Ragnhild Hatton, "New Light on George I," in Stephen B. Baxter, ed. England's Rise to Greatness (1983): 213–55, quoting p. 241. ^ Reed Browning, Duke of Newcastle (1975) pp 254–60. ^ J. H. Plumb England in the Eighteenth Century (1950) p. 68. ^ Vincent Carretta (2007). George III and the Satirists from Hogarth to Byron. pp. 44–51. ISBN 9780820331249. ^ D. Leonard (2010). Eighteenth-Century British Premiers: Walpole to the Younger Pitt. p. 94. ISBN 9780230304635. ^ Peter Kellner (2011). Democracy: 1,000 Years in Pursuit of British Liberty. Random House. p. 264. ISBN 9781907195853. ^ Joel H. Wiener, ed., Great Britain: the lion at home: a documentary history of domestic policy, 1689–1973 (1983) 1:66–67. ^ Paul Langford (1998). A Polite and Commercial People: England, 1727–1783. pp. 54–57. ISBN 9780198207337. ^ Dorothy Marshall, Eighteenth Century England (2nd ed. 1975) pp 183-91. ^ Jeremy Black, "Foreign Policy in the Age of Walpole." in Black, ed., Britain in the Age of Walpole (1984) pp 144–69. ^ C. Grant Robertson (1921). England under the Hanoverians. p. 66. ^ A.M. Wilson, French Foreign Policy during the Administration of Cardinal Fleury, 1726–1743: A Study in Diplomacy and Commercial Development (1936) online. ^ Williams, Whig Supremacy pp 259–70. ^ Stephen Brumwell and W.A. Speck, Cassell's Companion to Eighteenth Century Britain (2002) p 288. ^ Dorothy Marshall, Eighteenth Century England (1974) pp 221–27. ^ Paul Langford, A polite and commercial people: England, 1727–1783 (1998) pp 28–33. ^ Frank McLynn, 1759: The Year Britain Became Master of the World (2005). ^ Asa Briggs, The age of improvement, 1783–1867 (1959), pp 66–73. ^ Harold B. Carter, "Banks, Cook and the Eighteenth Century Natural History Tradition", in Tony Delamotte and Carl Bridge, eds., Interpreting Australia: British Perceptions of Australia since 1788, (London, Sir Robert Menzies Centre for Australian Studies, 1988), pp. 4–23. ^ Alan Atkinson, "The first plans for governing New South Wales, 1786–87", Australian Historical Studies, 24#94 (1990), pp. 22–40, p.31. ^ Philip Lawson, The East India Company: A History (Routledge, 2014). ^ Philip J. Stern, "History and historiography of the English East India Company: Past, present, and future!." History Compass 7.4 (2009): 1146–1180. ^ Roger Knight, Britain against Napoleon: The Organization of Victory, 1793–1815 (2013) pp 61–62. ^ Linda Colley, Britons: Forging the Nation 1707-1837 (1992) pp 35, 53-54. ^ "British History – The 1798 Irish Rebellion". BBC. 5 November 2009. Retrieved 23 April 2010. ^ John Ehrman, The Younger Pitt: The Consuming Struggle (1996), pp 158-96. Cannon, John. Aristocratic century: the peerage of eighteenth-century England (Cambridge UP, 1987). Cowie, Leonard W. Hanoverian England, 1714–1837 (1967). Langford, Paul. Eighteenth Century, 1688–1815 (1976), a history of foreign policy. Leadam, I. S. The History of England From The Accession of Anne To The Death of George II (1912) online, highly detailed on politics and diplomacy 1702–1760. Plumb, J. H. Sir Robert Walpole: The Making of a Statesman (1956) ends in 1722; vol 2: Sir Robert Walpole, The King's Minister (1960), ends in 1734; vol 3 never finished. Devereaux, Simon. "The Historiography of the English State during ‘the Long Eighteenth Century’: Part I–Decentralized Perspectives." History Compass 7.3 (2009): 742–764. Schlatter, Richard, ed. Recent Views on British History: Essays on Historical Writing Since 1966 (1984) pp 167–254.